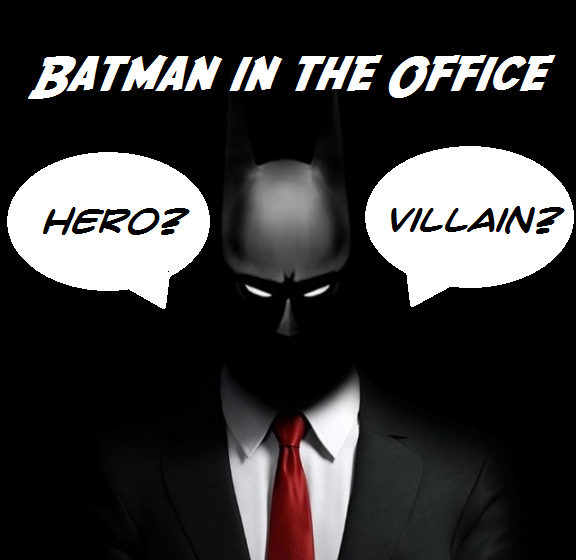 Batman in the Office… HERO or VILLAIN? Like most kids growing up, I was a big fan of superheroes. Truth is… I still am. Over the years though, both my taste in and definition of a “Superhero” have changed significantly. When I was young, my “standard of excellence” was clearly Superman. The guy was virtually indestructible, with superhuman strength, impenetrable skin, and the ability to absorb any impact without injury. He truly was the “Man of Steel”. In addition, he had unique and amazing superpowers, like x-ray vision, freezing breath, and of course the ability to fly. Even his one weakness was not a human weakness… it was a susceptibility to kryptonite, a rock from his home planet. He literally was from “out of this world”… an alien from Krypton who might have looked human, but was literally superhuman. He was my quintessential superhero, with amazing powers, unique abilities, and no human weaknesses. Then there was Batman. To be honest, as a kid I never really saw the appeal of Batman as a superhero. The guy was strong, but he was not super strong, as his abilities were the result of training and hard work rather than some sort of alien or mutant ability. Many of his “powers” did not come from internal talents like Superman’s x-ray vision, but rather through cool gadgets and devices like the Batmobile, his utility belt, and a grappling gun. And most of all, although he wore a cape he couldn’t actually fly! Batman never seemed to fully embrace his superhero status, and preferred to work in the shadows… not to be the symbol of a hero always in the limelight, but rather to be an undercover hero, working behind the scenes. He was always his own boss and was willing to break society’s rules, guided by his own internal principles to get the job done. Beyond that, Batman made mistakes… his temper, emotions, and risk-taking led him to make bad decisions and, while he always won in the end, it was often a bumpy ride. Essentially, where Superman was superhuman, Batman was merely a “super” human, in all senses of the word, still susceptible to injury, mistakes, and failure. As I have grown up, my appreciation for Batman has also grown, and I now think that he is the most impressive of all the superheroes. Superman, for example, was destined to be a hero, with his alien abilities allowing him to accomplish things that no human could ever dream of. Batman, on the other hand, made a conscious choice to take the risk and transform himself into a hero and to do whatever was humanly possible to make a difference. Essentially, Batman was an innovator. He used his natural intellectual talents and invented and utilized cool tools and toys to provide himself with a unique, competitive advantage. He trained and grew his strength and skills through hard work, extreme effort, and grueling training. And most of all, Batman leveraged his passion to fight crime and to bring justice… not for personal reward or accolades, but because it needed to be done. Batman was not born a superhero… he transformed himself into one, assuming significant risks and sacrifices to do what he deemed necessary to give Gotham City the hero it desperately needed. Our organizations need superheroes of our own. I am going to venture a guess that if I were to say “Superhero in the workforce”, the majority of people would imagine Superman and not Batman. This is the “Superhuman” who leaps tall buildings in a single bound, is the face of the organization, and who follows and enforces each of the organization’s rules. This is the stereotypical “leader” who willingly takes on the role of “hero” and both seeks and relishes the attention and accolades that come with the role. But what about the “Batmen” and “Batwomen” of our organizations? Take a moment and think about this different type of organizational superhero who is less in the limelight, but critically important in delivering amazing results. This is the person who always gets called into the critical crises, to find creative, agile solutions to seemingly impossible problems. He or she may not be the “leader” on paper, but is recognized by peers as an organizational “superhero”. This “Batman” is not afraid to get his hands dirty, accepts and embraces the risk of failure, and is willing to break rules and orthodoxies if they get in the way. These “Batmen” will do whatever is necessary to solve a crisis and our guided by internal principles, passions, and measures of success, while far less concerned with external rules, recognition, and accolades. These “Batmen” are not driven to deliver amazing results so as to be seen as a “hero”, they are driven to be a hero so as to deliver amazing results. As you think about the leaders in your organization, can you identify the “Batmen” who may not always be the face of your organization, but are often its heart and soul? Further, does your organization consistently reward and respect this different type of leader, or does it actually punish and discourage them? In times of crisis, we are of course more willing to “send out the Bat Signal” and call for Batman to do whatever he deems necessary and to break any superfluous rules so as to get the job done. But when the job is done, do we continue to support this approach or do we punish his unique, principle-based approach in favor of a more established, rule-based one? Do we recognize him for his results and accomplishments, or do we criticize him for the rules he broke and for the rebellious approach that he took? Essentially, do we know the Batmen in our organization and do we respect them as superheroes or do we treat them as super-villains? He often “Leads from the Shadows” and not from the podium. Batman knows that he is a hero and a leader and is not seeking external validation or recognition. He is less concerned with proving himself to his management above, but rather to support and to “rescue” the organization around him. He has a vision, a plan, and a legion of followers, but is truly a “servant leader” and is concerned with real rather than perceived leadership. He does not seek and even avoids credit. The reward for Batman is the successful completion of a mission and not the credit for his personal accomplishments. He often shies away from the limelight, feeling that his successes are “all in a day’s work” and that personal recognition is unnecessary. He often will even support and promote recognition of everyone else around him… not just to deflect the attention but to further support and to serve the organization around him. He doesn’t ask permission… taking both risks and accountability. Batman has a bias toward action, and has the self-assurance to take a risk, knowing that even if something goes wrong that he will find a way to fix it. He is not paralyzed by a “fear of failure” but energized by the “possibility of success”, and trusts in himself to take action and to succeed. He will set his own success criteria, and when he is wrong (and he will be wrong sometimes), Batman will take full accountability both for the “mistake” as well as for the “solution”. He breaks rules in favor of principles. While Batman won’t break rules for the sake of breaking rules, he also won’t follow rules purely for the sake of following them. He will have very clear principles to guide his actions, but if a specific rule gets in the way of his principle-based action then he will not hesitate to break it. While he will likely recognize that there can be consequences to these broken rules, he is willing to accept then in pursuit of the “big picture”. He does what is right and not what is popular. This is where Batman can be both heroic and dangerous. He will be very confident in his own sense of “right and wrong” as well as in what decisions need to be made to drive progress toward a goal. He will be less concerned with external political motivations than his internal instinctive motivations, and will thus often push in a direction off the path of the prevailing management or organizational point of view. While on one hand, this can help push through some complexity and bureaucracy to drive progress, it also can alienate him from his management or from the organization. Depending on how big the gap is between his view of “right” versus the organization’s view of “popular” will dictate whether he is seen as a superhero or a supervillain. He is always called in for a crisis. Batman will shine in a crisis and will likely be called in for the most critical and urgent problems and challenges. Because he does not fear failure and is accountable for his actions, he is willing to take risks to find agile solutions, and to use “cool tools” that others are not able or willing to try. Batman will do his best work under the adrenaline rush of a crisis and will thus shine when he is needed most. However, he may struggle in “normal” business situations as he can become bored and uninspired, and because the organization may be come less accepting of his “rule-breaking” approach when outside of a crisis. Is better with a sidekick and mentor. Batman is most likely going to be extremely independent and have a difficult time in asking for help. That is not to say that he is an ineffective leader… he likely will have followers and the ability to inspire and guide others. However, when it comes to obtaining help for himself personally or to have a partner in taking risks and accountability, Batman will often default toward operating alone. However, when he does have support from a Robin­ to help in balancing his passion with pragmatism and his “fearlessness” with caution, he can more effective. Further, if supported by a key mentor, like Alfred the Butler, who cares for him and helps to “clean up his messes”, he can maintain his freedom in being fearless in his risk-taking approach knowing that he has someone looking out for him in case issues arise. While Batman likely will naturally gravitate toward operating independently, if smartly paired with a sidekick and mentor his superhero effectiveness can be maximized. Batman will quit fighting and go back to his “cave”. Batman will become a “super villain”, pushing back against his critics and causing more harm than good. Ambitious for the Company, and Not Themselves. Essentially, he described Batman. While these leaders may not fit the stereotypical view of “superhero”, with their face on a billboard and their successes on their sleeves (or on their chests), they are critical to the success of an organization. So, are these leaders who “lead from the shadows”, willing to take risks, to fail, and to take accountability, treated as heroes or as villains in your organization? We’re big Batman fans and I love this post. I’m going to show it to my teens! Thanks @stuffytales! Funny that you should say that… This is my first post that my kids have really enjoyed. Thanks! of course due to poor time management I am just getting to read this… loved this… after watching the Avengers last night it made me wonder how Ironman fits in this. So self-absorbed and narcissistic yet he risked his life twice in the movie where others would have probably not. Maybe you can use the Avengers for a future blog post.